Over a year ago I wrote about how we were downsizing to a minimalistic wardrobe after we moved into our camper. 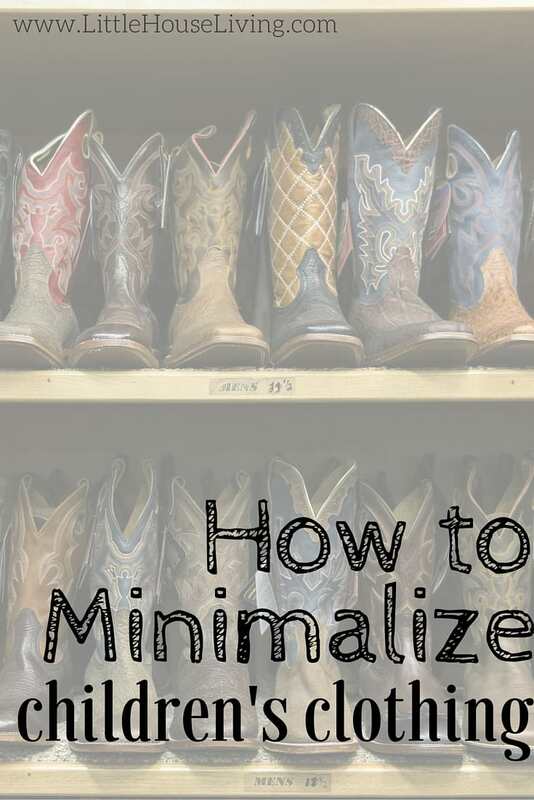 I shared a few tips on how to get your wardrobe to a more manageable size. Now after spending more time with our minimalistic wardrobes I’ve got a few more tips for you on how to keep the clothes clutter to a minimum! 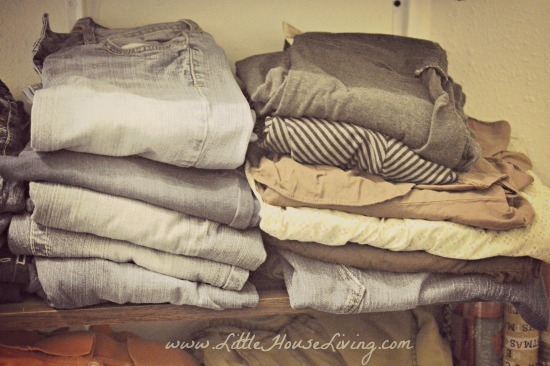 After I initially cleaned out our closets I realized that there is much more to keeping minimal clothing than just cleaning out what you aren’t using! It’s easy to get tempted and side-tracked by sales, gifts, and other things that can add the bulk back into your closet and put you right back to where you don’t really need to be. Here are some of the things we’ve done to keep on track. 1. Maintain your clothes wardrobe. That may mean doing another purge every few months to keep it fresh and relevant to what you are wearing. Or it may mean that you need to take a good look through it once a year to see what will need to be replaced. 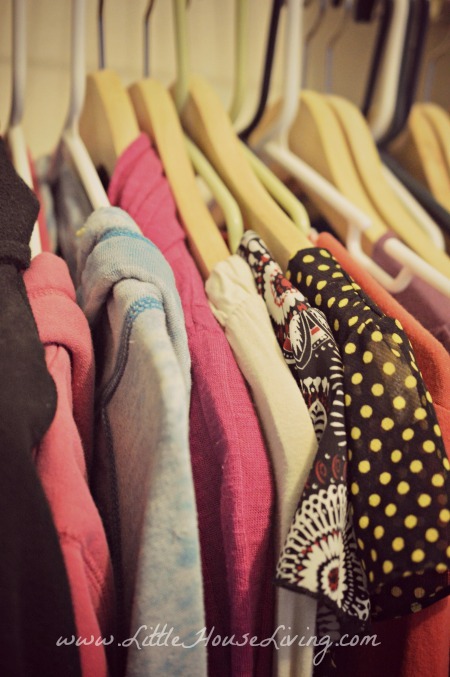 Either way, make sure you check on the closet every so often to make sure you are maintaining the minimalistic amount of clothing that you are hoping to have. Until this month we didn’t even have a dresser yet, we were keeping most of our clothes in fabric bins. It was working alright but we couldn’t see all the clothes and weren’t sure what we had. After clearing out the bins and getting a proper dresser for our clothes, we cleaned out a full garbage sack of clothes to sell on our rummage sale! 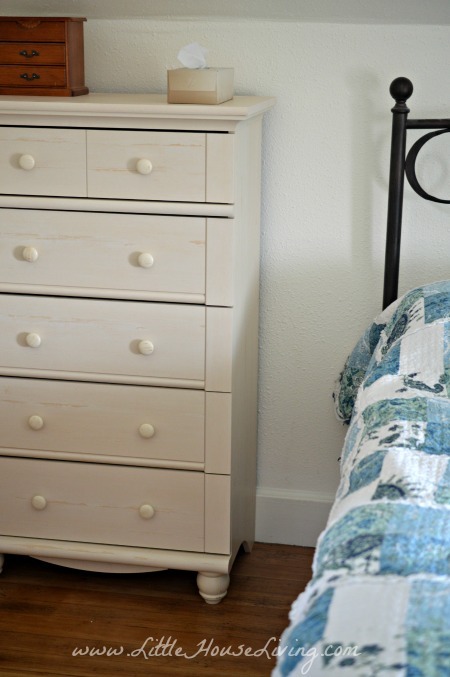 We found this beautiful 5 Drawer Dresser from Sauder that matched the bookshelf that we have in our room. 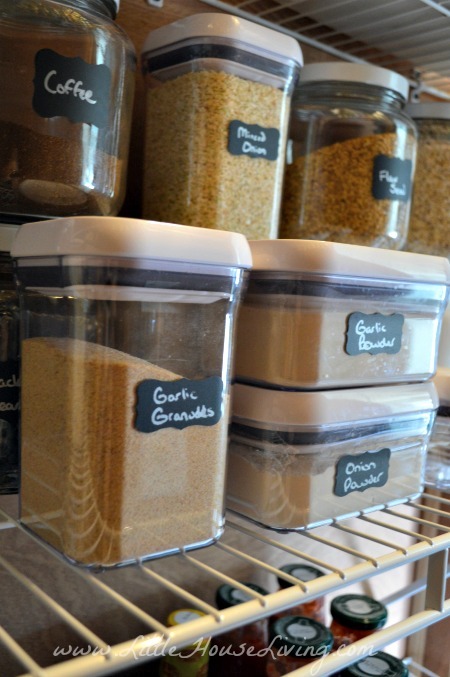 It was a perfect fit for all of our underclothes, pajamas, socks, warm clothes, belts, etc. 3. Be able to see your clothes! Bouncing off idea #2, make sure that you can actually see and find your clothing! Once we moved out clothing out of the bins we also put up some shelves. Now I can see each of my pairs of jeans, shirts, and everything. If you don’t have room for shelves, hanging up all of your clothes will also create this visual. After we put our clothing up on shelves I felt like I had a whole new wardrobe! 4. Don’t always get rid of what you aren’t using. While cleaning out of clothes this year, my hubby and I both noticed that we had many things that fit us well but we weren’t really wearing right now. It didn’t make sense to get rid of it since we knew we would wear it and living the lifestyle that we do, our clothes tend to wear out quickly. So now we have a “Later” box that has some clothing for each of us that we can pull out when we have things that wear out. 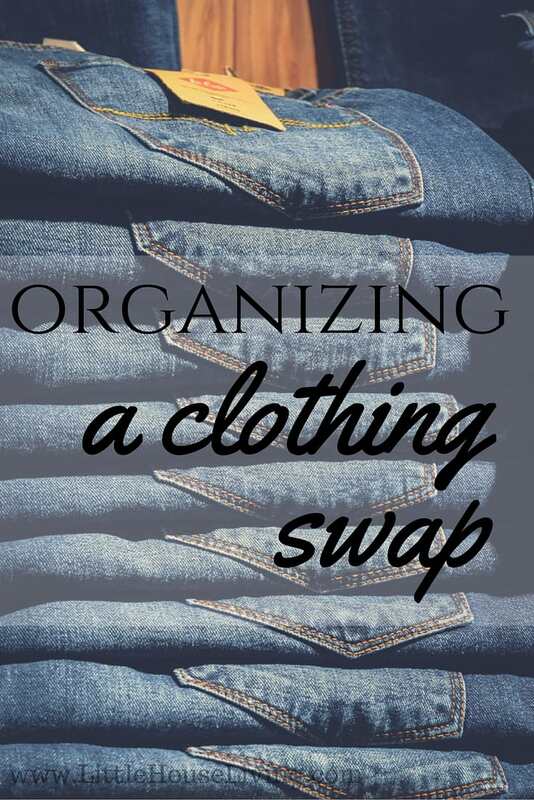 It doesn’t need to sit in our closet and take up space since we aren’t wearing it now but we have it for when we need to refresh our wardrobe instead of having to make a trip (and spend money) at the store. Although when I do need something “new” in my wardrobe I’ve been ordering what I need through Twice. I love that website! These are just a few ways that we are not only making a minimalistic wardrobe but maintaining that wardrobe. So far it’s been working well and we’ve been spending less and less on clothing as the years go by. What are some tips that you have to share about maintaining a minimalistic wardrobe? Do you have a certain number of garments? *This post is sponsored by Sauder, but any and all opinions any and all opinions stated in this article are my own. We went Plain a few years ago and what a difference it made. I have a *very* minimalist wardrobe, essentially a “uniform” of a few different (but similar) dresses of different weights. My husband wears black work pants and navy work shirts, and I joke that people might think he only has one of each. He doesn’t – he has several. Probably more minimalist than most people would want, but I love it. I still haven’t found a good home for my sweaters, and it’s January. Right now they’re piled in a corner of my bedroom. This post reminds me that I need to get that worked out. Now that I’m taking the time to think about it, I think an under-the-bed box is going to work best. my problem is that I have no will power when it comes to pretty clothes! I used to because I couldn’t find a great source for cute fashionable PLUS size clothing, but I have now – and I have to reign myself in. does that reigning in ever get easier? more. I have my own distinct “look”, that is affordable and timeless. I love your idea of the Later Box. Fantastic. Like yourselves we have clothing we wear a lot, and consequently wear out, due to our lifestyle. I am definitely giving that a go. And my tip: I change my wardrobe over every 6 months; spring/summer, autumn/winter, putting away one seasons bringing out another, with all-season staples staying put. This makes me feel like I have new clothes every 6 months, so I never feel deprived. It also makes me look at the clothes to see how they are holding up and make any repairs if needed. I think with out the ‘fun’ of the changeover I would put this task off as long as I could. I also have a later box. Boxes, I should say, they are stashed under my bed. I used to have one big tub that I kept in my closet floor. But it was too bulky and got in the way. It was also too difficult to empty and repack every time I needed something from it. The smaller under bed boxes are much easier to look through and find exactly what I need, usually special occasion clothes. I go through my closet and try my clothes on because I have lost weight with my healthier lifestyle. The fat clothes had to go because I am not going there again. I also ask myself one simple question when I try my clothes on. If I was seen wearing this by a very important person, would I be embarrassed? You would be surprised at how many times I said “h**l yes” then dumped the garment in the donate box. BTW, I love Sauder products too! My Sauder chest of drawers are my favorite pieces of furniture. Has anyone here ever taken in their larger clothes to fit a smaller size after they lose weight? I have had to buy clothing for our three young adults recently. Here are some tips on trying to save money if someone is in that situation. Buy professional capsule wardrobe in three colors only. Make it mix and match as much as possible. Buy the whole capsule wardrobe in January. The prices are much better then, especially at outlet stores. Look for suits or jackets that a friend may have that no longer fit them. In July, bring something old that father no longer needs to Men’s Wearhouse and get 50% off a new item young adult might need for an interview. Encourage young adults to buy thrift store clothes for everything that is not work capsule wardrobe. Get nice shirts from a neighbor and seam rip them to sew one size smaller.